Site Safety: Electrical Cords – Sapia Builders Corp.
Electrical extension cords that have been damaged or are improperly used can cause injuries, electrical shock or even fatalities. Cords can be easily abused on a job site because they are frequently yanked, kinked, twisted, pulled and stepped on. Even the normal wear and tear on flexible extension cords can loosen or expose wires, creating a hazardous condition. 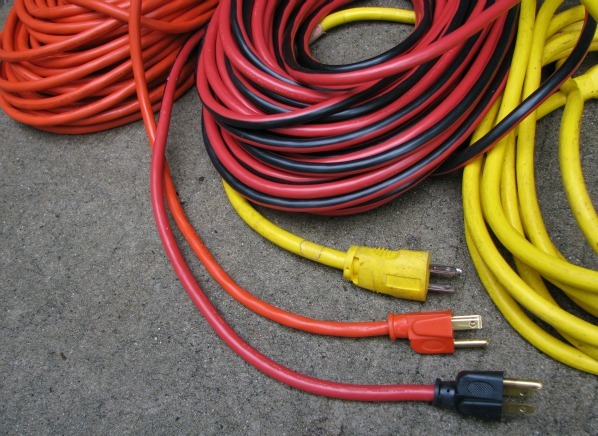 Make sure extension cords are heavy enough for the amount of current they‘ll carry. For portable electric tools used in construction they must be UL approved, have strain relief and a three prong grounding plug, and be rated for hard or extra hard uses. Verify that the extension cord has the designation “S” (e.g., ST, SO, STO, etc.) in the cord marking to indicate that it’s approved for hard service. Before each use inspect the cord for damage, such as nicks, cuts or abrasions in the outer insulation. Look for loose or missing plug blades and indications of overheating or burning, especially on the plug. Damaged cords should be removed from service. Don’t drag cords over rough surfaces. Don’t use them to lift or pull materials. Don’t disconnect cords by jerking them out. They should be disconnected at the receptacle. Don’t string electrical cords through water or oil and grease. Don’t hammer nails or staples into cords. Place cords where they won’t be tripped over or trampled on. If possible, they should be suspended or secured in such a way as not to block or hang in walkways, doorways or work areas. Avoid plugging two cords together to make a longer one. Its best to use one cord in a continuous length from the receptacle to the tool. Extension cords which are either connected together or are too long will reduce operating voltage and efficiency. When not in use, the electrical cord should be neatly coiled in large loops so as not to kink the cord. BE SAFE – ALWAYS INSPECT ELECTRIC CORDS BEFORE USING – DISCARD WORN OR DAMAGED CORDS!